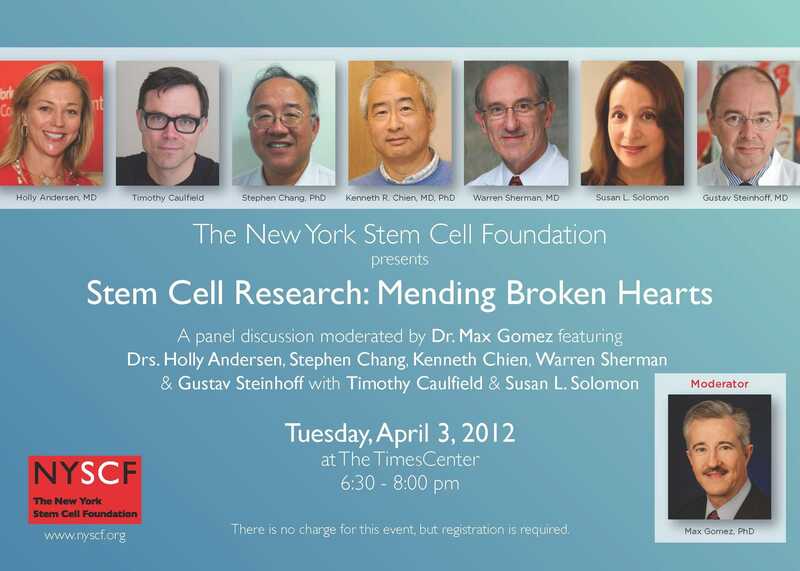 The New York Stem Cell Foundation (NYSCF) held its seventh annual spring public outreach event to bring together global experts on heart disease, bioethics, and stem cell research to discuss current efforts to apply stem cell breakthroughs in the treatment of cardiac disease. On April 3rd, over 200 people gathered at The TimesCenter in New York City to hear a panel discussion on heart disease and stem cell research. Stem Cell Research: Mending Broken Hearts was moderated by CBS News’ Dr. Max Gomez and featured global experts on heart disease, bioethics, and stem cell research discussing the latest developments in the field and the current efforts to apply stem cell breakthroughs in the treatment of cardiac disease.